Canopy Growth Corp.’s venture capital arm is barred from investing in the U.S. pot market, but its founders are ready to take advantage of “the most compelling opportunity in the history of capitalism,” if federal laws change. Like many of its peers, Canopy Rivers Inc. has to steer clear of U.S. marijuana investments because its Canadian listing requires that issuers comply with federal laws in the jurisdictions where they operate. Although cannabis is legal in several states, it remains illegal at the federal level. But co-founders Sean McNulty and Peter Hatziioannou say regulatory reform is already underway and they are keeping tabs on potential U.S. opportunities through XIB Consulting Inc., their outside consulting firm. “If Canopy Rivers could invest its own capital into the States, you would see one or both of us go all in on Canopy Rivers,” McNulty said in an interview at the company’s Toronto office. Because it can’t just yet, the company keeps itself “very plugged into other ideas, competitors and opportunities" through XIB, he added. McNulty and Hatziioannou, who met on the M&A advisory desk at Canadian Imperial Bank of Commerce and have worked together on and off for over a decade, created XIB in 2016 to provide advisory services to a sector that had plenty of entrepreneurs but little capital markets experience. Canopy Growth was XIB’s first client and quickly became a large portion of its business. The Smiths Falls, Ontario-based company is worth $10.8 billion, making it the world’s second-biggest marijuana company by market value. However, McNulty and Hatziioannou found they were turning down investments because Canopy was only interested in companies it could own and operate. “We decided to create a separate vehicle where we would could take minority interests, create alternative transaction structures and provide both growth capital and strategic support,” McNulty said. That vehicle became Canopy Rivers, which is about 25 per cent owned by Canopy Growth and counts chief executive officer Bruce Linton as its acting CEO and chairman. Canopy Rivers listed on the TSX Venture Exchange in September via a reverse takeover after raising $104 million in a private placement. It closed Friday with a market value of $685 million, down 54 per cent since its listing on Sept. 20. Canopy Rivers’ portfolio consists of 11 companies including Civilized Worldwide Inc., a cannabis media and lifestyle brand, LiveWell Foods Canada Inc., a nutritional company that sells hemp products, and Canapar Italy, a firm that works with Sicilian farmers to cultivate hemp. 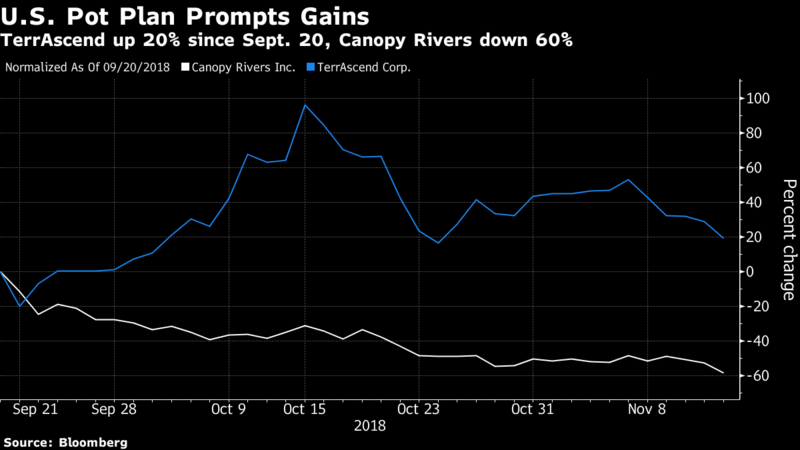 Another holding, a Canadian licensed producer called TerrAscend Corp., will give Canopy Rivers an indirect entry into the U.S. market that could act as a model for future U.S. investments. TerrAscend wants to expand into the U.S. market through acquisitions and is able to do so because it’s listed on the Canadian Securities Exchange, which allows U.S.-focused pot firms. However two of its largest shareholders, the Canopy companies, wouldn’t be able to remain shareholders because of their exchange restrictions. To solve this problem, the two Canopys agreed to convert their common shares in TerrAscend into exchangeable shares, which can’t be transferred or monetized and aren’t entitled to voting rights or dividends. If U.S. federal law changes, they can be converted back into common shares. If the arrangement is approved by TerrAscend shareholders, which is expected to happen by the end of the month, it could set a compelling precedent for other U.S.-related transactions, McNulty said. Meanwhile, there are no shortage of other investment opportunities for Canopy Rivers to consider.